The Fischer's Turaco or Touraco De Fischer (Tauraco fischeri) is a species of bird in the Musophagidae family. 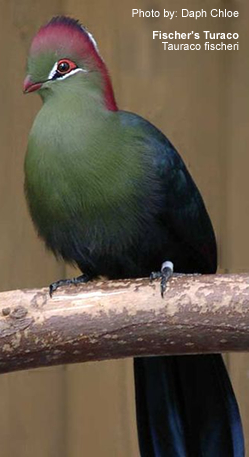 This Turaco is found in East Kenya, South Somalia, East Tanzania, Nambia, Angola, Zambia, South-Eastern parts of the Democratic Republic of the Congo (formerly Zaire), Malawi, Namibia, North-east Botswana, Zimbabwe, and Mozambique. It is the only Turaco species to be also found outside mainland Africa - living on the offshore island of Zanzibar. As they prefer humid forests areas, their natural habitats include subtropical or tropical moist lowland forests and moist montanes, and arable land. They can be seen in dry open savanna woodlands, farms, parks and suburban gardens - often near water. They have violet-blue upper parts and measures approximately 40cm in length, beak to tail, and weighs between 227g and 283g. Its diet is mainly fruit, like wild figs, berries, flowers and buds, leaves, termites and snails. 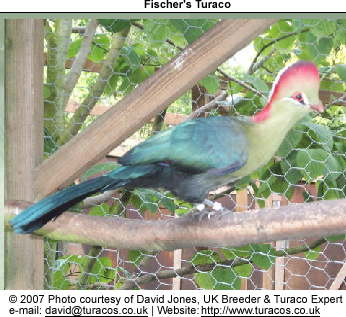 If you are interested in purchasing a Turaco, please visit this website for available birds.